Thank you for visiting our website, which I hope you find to be useful and informative. 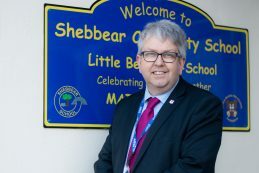 I became the Head Teacher of this lovely primary school – which was founded in 1877 – in September 2018 and am looking forward to ensuring that the school continues to thrive and grow. If you are contemplating moving to this delightful area and would like to contact the school, in the first instance either telephone or email our school administrator, Mrs Hawker, on the contact details provided below. The school was assessed as a ‘Good’ school in the OfSTED inspection held on the 15th November 2016 and this reflects the dedication, commitment and hard work of the staff, governors, pupils and parents of our school. Our school is set in the heart of the Devon countryside, in the small rural village of Shebbear which has its own shop, Church and Chapel. Shebbear regularly features within the top ten best places to live – and we have to agree! We employ a four class structure during the mornings and a three class structure throughout the afternoons, which means we have small class numbers ensuring that every child receives the best possible education that we can provide. We also get to know our children really well. 1. Our school has a family feel – we know and care for our children as individuals. Their well-being and personal development is as important as academic achievement. 2. We have high expectations – we want all of our children to achieve the very best they can whatever their circumstances and starting points. We also have high expectations of their conduct and attitudes. 3. We support our children to become future citizens – to develop the skills and resilience they need to be lifelong learners, adaptable and able to face the challenges of the 21st century. Many visitors to our school comment on the ‘family feel’ that the school has – I do hope that you can visit soon and experience that for yourself – we look forward to meeting you.